“Symphony of the Soil” is the perfect way to end this year’s Friday Food Film series. Without soil, there is no life – soil is that thin layer where life is possible. The miracle of how all things on this planet exist is presented in a journey of how soil forms, from glaciers wearing rock down to a mineral sludge that flows into the sea, to sphagnum moss, to sand, the film explores the trifecta that allows us to feed ourselves. Beautifully shot with sweeping images, “Symphony of the Soil” allows you to marvel at the complexity of our world as well as gifting you to travel virtually to Wales, Hawaii, Egypt, India, and more. 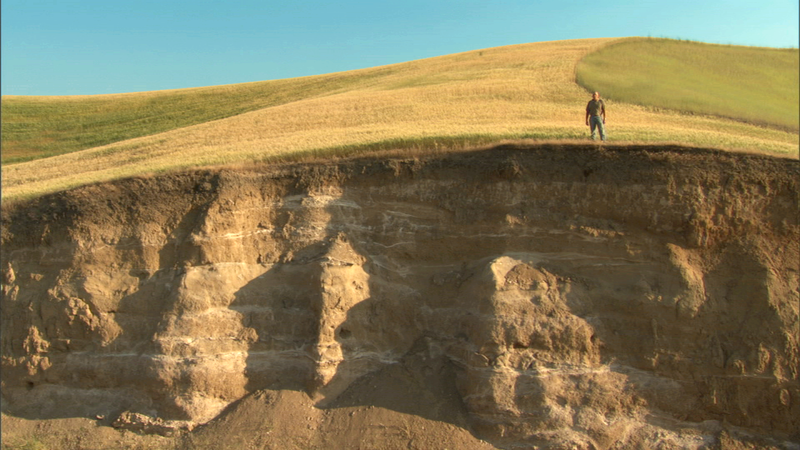 As someone who is rather in love with geology, this film was a treat. Even if studying rocks isn’t your jive, “Symphony” is fascinating and easy to watch with animated watercolors prettily explaining how healthy soil functions and grows. It’s a little too easy to take soil for granted. It’s integral to our existence, but it dwells beneath our feet. The film does an amazing job of allowing soil to be the star of the show. We’re shown how we treated it in the past, how we’ve misused it, and how we’re beginning to respect it once again. The health of our soil is not only the health of our ecology, but our health as well. Only by learning how to treat it as the living organism that it truly is will we be able to heal our planet and create a system that allows all life – including the gigantic number of human beings – to thrive. Each year, I track down food films to be shown at the food co-op in which I work. Each year, I’m guided by the choices of SYRCL’s Wild and Scenic Film Festival, but in previous years, I discovered many films on my own. This year, I was incredibly lucky because Wild and Scenic screened some amazing food films, so I was able to just follow suit. Our first screening, on February 1, actually won the award for Best of Festival. “Cafeteria Man” deserved the honor. Frustrated by the pre-plated, packaged, and highly processed foods with which the cafeteria presented them each day, a group of school children took it upon themselves to share the food with school administration. That moxie inspired a change in the way the Baltimore School System viewed their food program, and Tony Geraci was hired as the Food and Nutrition Director. Geraci made sweeping changes to the food system, introducing fresh produce, freshly cooked meals, and sourcing food as locally as possible. He involved the students in learning how food is grown, how to prepare it, and how to serve it. The empowerment and wonder on children’s faces as they taste food freshly picked from the soil is reason enough to watch the film. Witnessing their joy when they get to eat the food they’ve prepared is another. 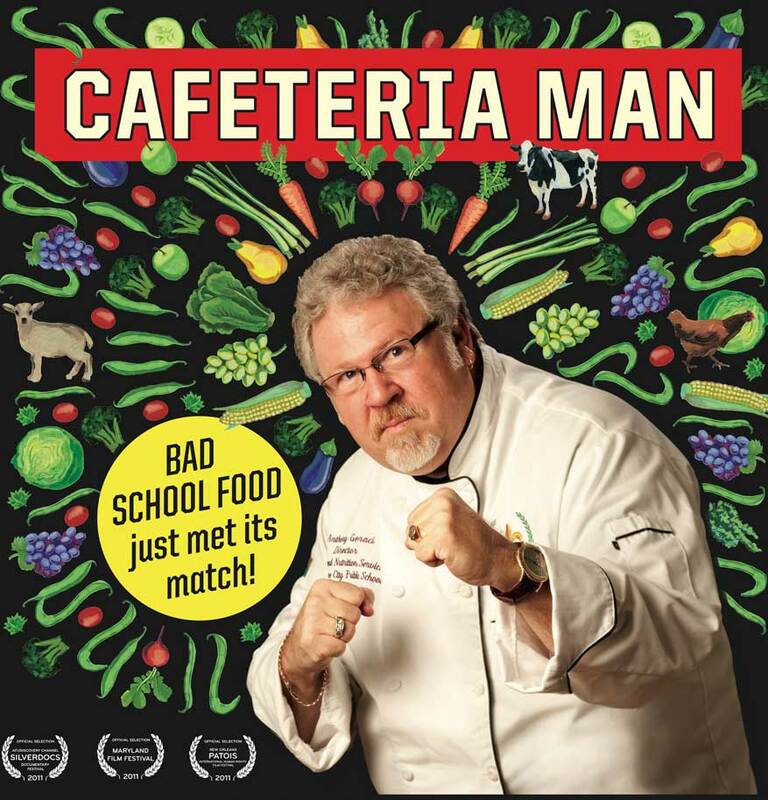 Geraci is another major reason to watch “Cafeteria Man.” He’s passionate. It’s easy to identify with him. He wants to make change. He wants that change to happen now. Just like most of us, he’s frustrated with being forced to wade through the muck of bureaucratic requirements. And he’s endearing. The job means so much to him, he’s possessed by it. It’s apparent that Geraci feels that kids deserve to experience real food. “We need to start treating our kids like the clients that they are,” he says at a convention for the Baltimore school food workers. “The jobs that we have are because of our kids,” he reminds everyone. Through helping children receive one of their most fundamental needs, real food, Geraci sees himself helping the future. He sees it as a way to help the city heal itself, using food as the vehicle. There is still a long way to go in terms of guaranteeing quality meals for school children across the country, but after watching “Cafeteria Man,” you’ll be filled with the hope and inspiration needed to keep the momentum going. The intense heat of summer may feel overwhelming at times, but without it, those luscious, red orbs of tomato-y goodness would not exist. 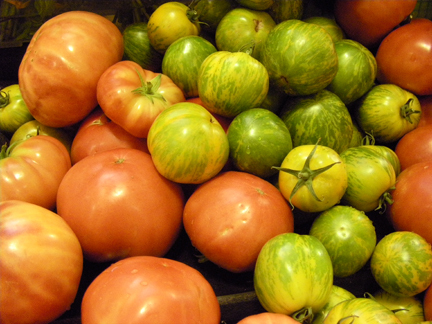 Of course, even one plant can create a ton of fruit, and man can only eat so many tomato sandwiches. 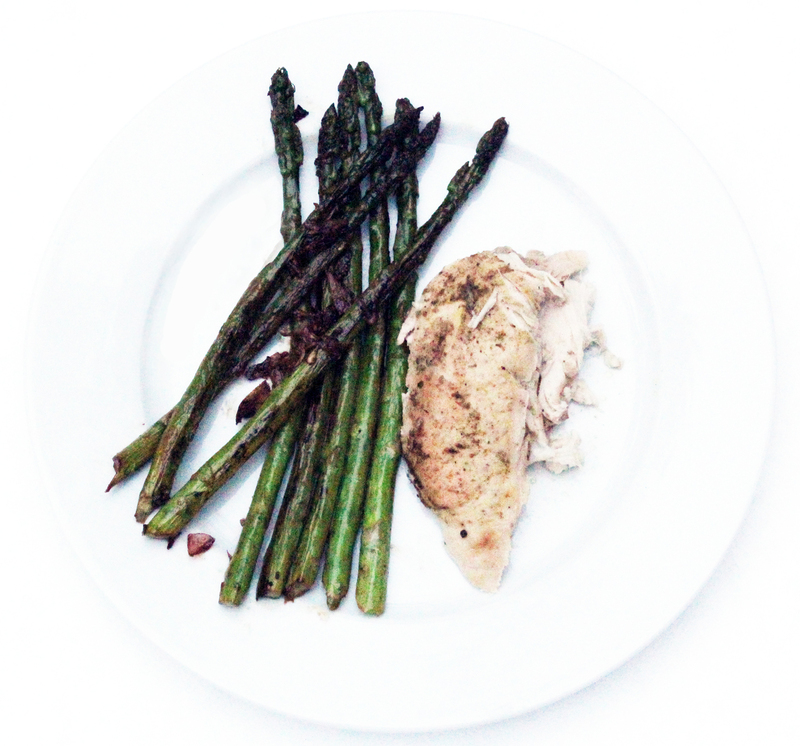 This recipe is sure to jump-start your cooking creativity. Preheat broiler. Set rack about 5 to 6 inches from heat. Cut tomatoes and jalapenos in half. Place them on a baking pan. Broil on both sides until tomatoes are lightly charred and skins are wrinkled and peeling off, approximately 5 to 7 minutes per side. Use tongs to rotate. Jalapenos will blacken and brown as well, and shrink down. Let cool, then peel and coarsely chop tomatoes, saving juice. Remove seeds and stem, and coarsely chop the jalapenos and set aside with tomatoes. While tomatoes and jalapenos are cooling, sauté onion in 1 tablespoon oil in a sauce pan or cast iron skillet until very soft and lightly browned. Add garlic and cook for another minute Add onion-garlic mixture to tomato-jalapeno mixture along with salt, and puree well in a food processor or blender. In same pan, heat 1 more tablespoon oil to very hot. Add puree to pan (it should sizzle and bubble) and cook for about 5 minutes. Stir continuously. Warning: it may splatter as well. Stir in stock and return to a boil, then lower heat and simmer for about 15 minutes, uncovered or until sauce begins to thicken. Remove from heat and stir in crème fraiche. Season with more salt if necessary. Breakfast during the week is oatmeal with blueberries plus a hint of pure maple syrup and a dash of half and half. Once the weekend rolls around, I’m usually craving something a bit more complicated. My favorite Sunday breakfast has become a dish that tastes amazing, but isn’t really that hard to do. Most of it can be accomplished while holding a cup of coffee in your left hand, constantly sipping the liquid, black elixir of life. In a large skillet, heat olive oil until it shimmers. Add the mushrooms and salt and pepper. Cover and cook over moderate heat, stirring a few times, about four minutes. Add the onion, stir and cover for three minutes. Add the sherry and cook until almost evaporated, a little over one minute. Remove from the heat, cover, and set aside. Place bread slices on a baking sheet and brush with olive oil. Bake for about 6 minutes, until toasted. Turn off oven. Transfer the toasts to plates. 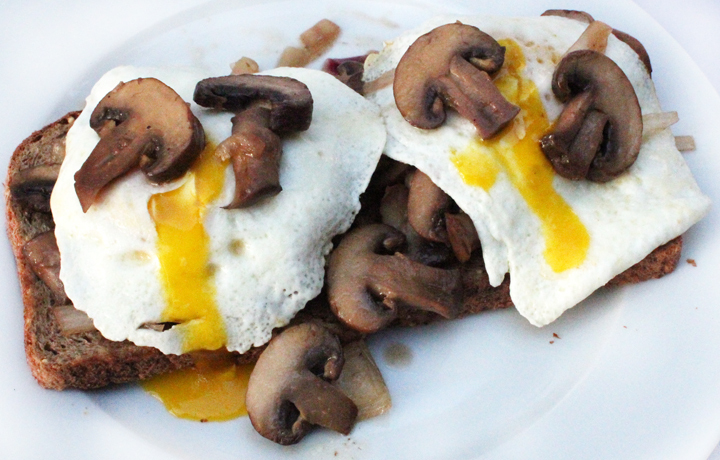 Spoon the mushroom mixture onto the toasts and top with the fried eggs. 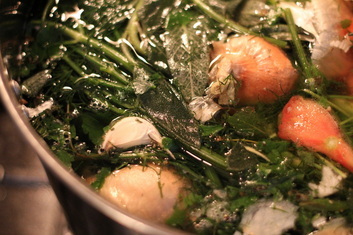 There’s something so fulfilling about making chicken stock. I feel so good about not wasting anything, and then I have a freezer full of additions to my cooking. I enjoy the whole process, too. Since I work full time, I do the majority of my cooking in the evenings. I’ll bake the chicken one night, let it rest, slice off a couple of pieces for dinner, and then cover it and place it in the refrigerator. The next evening, I do what is so elegantly called, “picking the carcass.” Any of the usable meat is kept for sandwiches, salads, etc. The bones, skin, and other various bits gets thrown in a large stock pot along with whatever extra veggies are sitting around. Now, there are die hard you-must-do-it-this-way-and-none-other stock makers out in the world. I feel making stock is about economizing, so I don’t buy extra ingredients for something that costs me nothing but extra time. My grandma taught me that wasting food was a Cardinal sin – and really, why do it? That said, there were always some things that found their way into the compost bucket instead of our bellies, and it bothered me. Then I realized that there wasn’t any reason to compost all the onion ends, extra celery stalks, the going-woody carrots, past-its-prime garlic, and meat trimmings. If I kept them until I had enough for stock, there would be practically no waste. In these days of using everything and saving as many pennies as possible, keeping a corner of my freezer reserved for unused produce just makes sense. I now have a couple of one gallon, glass jars with screw on lids into which I throw all of my extra produce pieces. Once I’ve baked a chicken and have the carcass ready for simmering, I throw everything from those two jars into the stock pot along with the chicken. Everything simmers slowly for hours. As foam gathers on the surface, it gets skimmed off, and after the concoction has reduced by about half, I turn off the flame and let it cool. Then the big pieces get removed with a slotted spoon. What’s left gets strained until just the clear stock remains. The stock gets poured into canning jars with a bit of air left at the top and are placed in the freezer for whenever they’re needed. It’s rare for me to not have stock in the house. Finishing this task always leaves me feeling warm, fuzzy, and accomplished. Wouldn’t it be nice if everything was like that? While we were on vacation a week ago, Charles and I did something that we hadn’t done in years — buy a meal from a fast food joint. The effects were immediate. We felt bloated, lethargic, not quite right. A few hours later, large, angry pimples had erupted all over my face — something that hadn’t happened since high school. The worst part was that my blood sugar was wonky for most of our vacation and followed into the work week. What to do? I thought the best option was to make a dinner salad, filled with different colors, textures, and flavors. 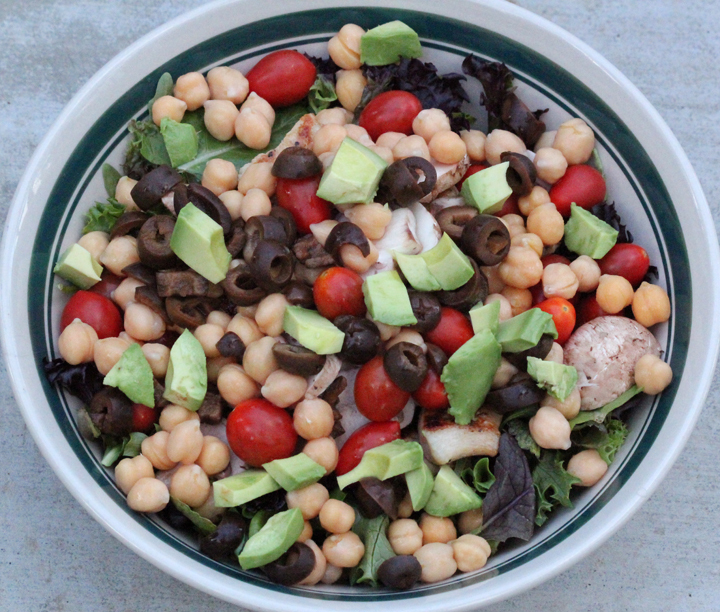 With assorted spring greens as the base, I layered grape tomatoes, crimini mushrooms, avocado, black olives, garbanzo beans, and a small smattering of sauteed chicken breast. It was just what we both needed to feel more like ourselves again. It had been so long since we had eaten true junk food, we had forgotten the consequences. The results may have been more pronounced since we usually eat such a clean diet, but it really brought home how important it is to eat as healthy as possible as often as possible. My body thanked me.